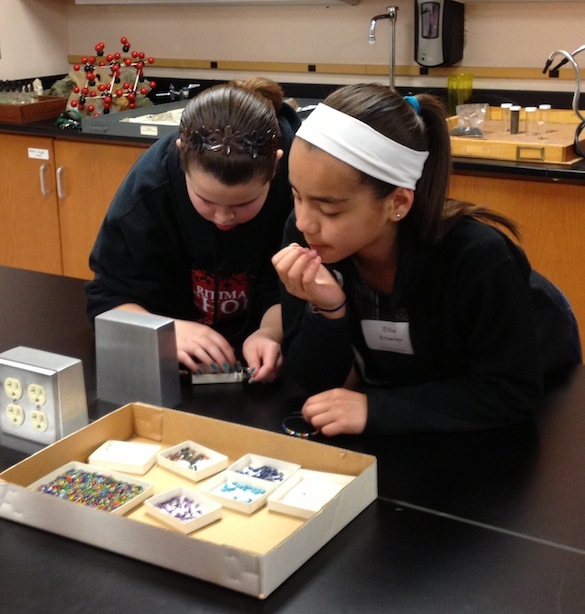 Wooster, OH – The Wooster X-ray Lab hosted girls from the Expanding Your Horizons program, a series of workshops aimed at encouraging young women to pursue careers in the sciences. The geology workshop focused on minerals and their wide variety of uses. One popular use of minerals is in beaded jewelry. 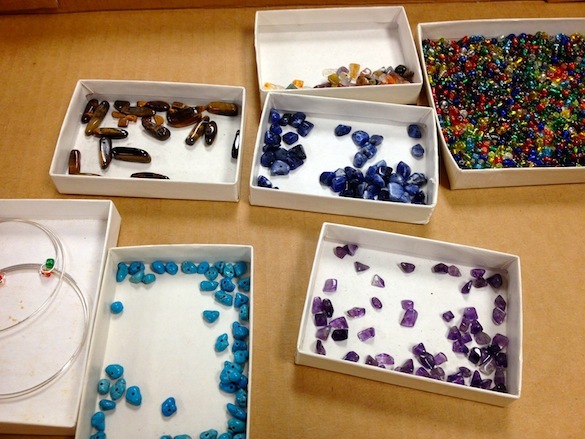 These colorful beads are actually polished pieces of minerals. Our goal was to figure out which minerals each bead represented. To do this, we used the X-ray Diffractometer (XRD). The XRD zaps the minerals with X-rays, which get reflected off of the atomic layers in the minerals, giving us information about their structures. Each mineral has a unique set of reflections, sort of like a fingerprint, which allows us to identify the mineral. One of the girls prepares a sample for the XRD. 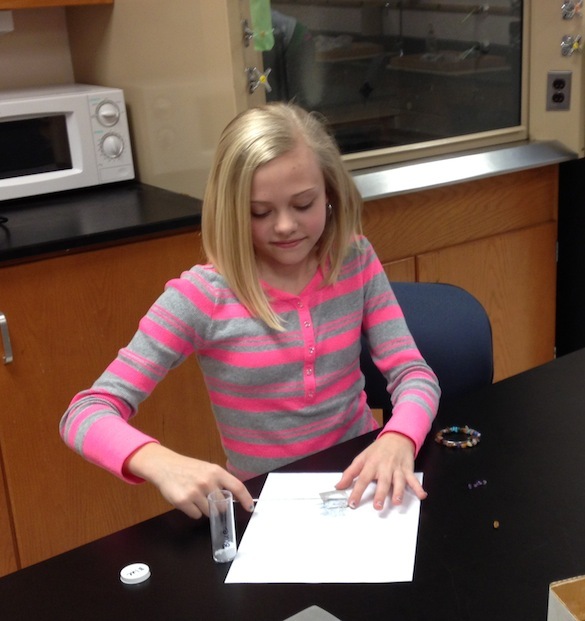 While we were waiting for the samples to run, the girls made bracelets out of the beads. 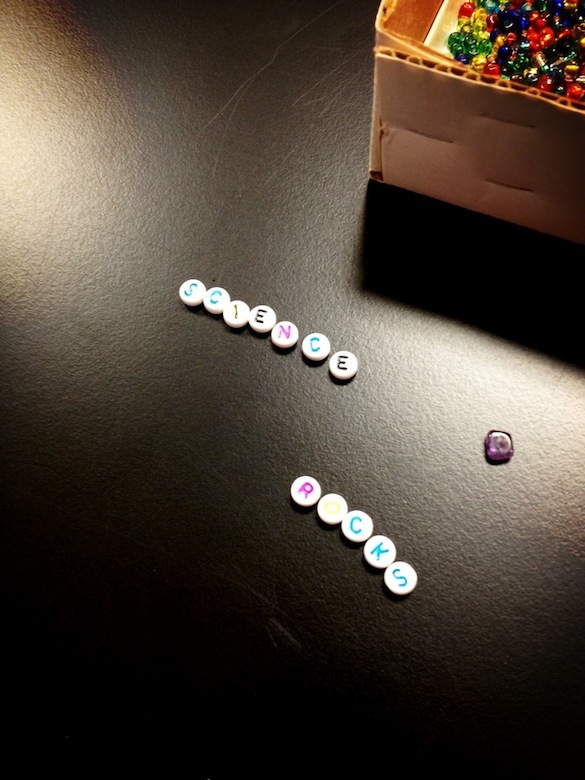 Someone made a bracelet that said, “Science Rocks!” We love the geology pun. By the end of the workshop, we learned that three of our beads were actually varieties of quartz: Tiger’s Eye Quartz, Amethyst, and Jasper. Our dark blue bead was Sodalite. Maybe the most surprising result was the bead that looked like Turquoise. It was actually Calcite! Tricky, tricky!